Safariland has expanded to include much more than just holsters. The use of ear plugs in loud working conditions is nothing new. 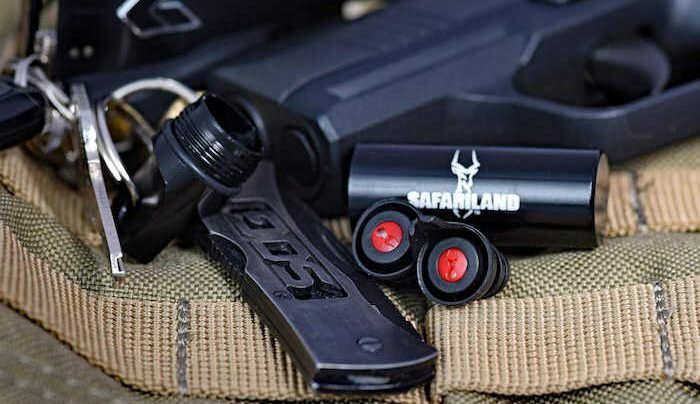 Safariland has advanced the simple foam ear plug into a technologically advanced product offering more than just a foam plug. In addition, Safariland provides a very nice aluminum canister allowing the user to carry high quality hearing protection with them wherever they go. This is perfect for protecting the plugs, and giving shooters an easy way to have hearing protection all the time. For the patrol officer enroute to a hot call, its perfect to be able to throw in these ear pro and be totally confident in being able to hear the radio with complete protection. The Safariland In-Ear plugs are made from a proprietary rubberized material providing a very comfortable fit when inserted into your ears. The core of the In-Ear hearing protection is a tube providing the framework for the outer components. This tube offers a small opening through its entire length. On the insertion side the hole is about (1) mm wide, providing plenty of space for air to escape during insertion and removal. The Safariland In-Ear plugs have a very convenient pull tab for removal. On the outward side there is a red, hard plastic plug with the Safariland gazelle emblem cut into the plug. However, directly behind the gazelle cut-out is a piece of metal. There is just a tiny cut-out in the metal to allow air to flow through, but not large enough to allow significant noise to penetrate. Behind all of this is the patent-pending impulse filter technology Safariland has used to advance these plugs to serious hearing protection. This design allows the shooter to be confident with the snug-fitting plugs inside their ears, without the concern of suction pressure making removal difficult. This tiny hole allows ambient noise so the shooter is not without some conversational hearing, even during drills (between shots). In addition, the exterior of the In-Ear rubberized material is layered into (3) cascading umbrella-like design layers in descending size. So the insertion “umbrella” is the smallest, then a slightly larger one, and finally the largest. This design provides the greatest potential for creating a proper seal within a wide variety of shooter’s ears, but to make sure Safariland includes two sets of plugs – one medium, and one large. The Safariland In-Ear has 3) umbrella-like outer edges for superior protection and seal. The “umbrella” style layers are open underneath, and act similar to the baffles in a suppressor. Any noise waves entering the ear and and trying to go past the outer edges of the Inner-Ear plugs are captured by the open areas under the “umbrella” fold. If some noise happens to make it past the big layer, there are two more layers of protection where the noise is captured and redirected back out of the ear while the waves themselves lose strength and power. The rubberized seal mates up to the walls of the shooter’s inner ear providing an excellent seal to prevent most noise from slipping past even the first umbrella fold. Finally, Safariland has included a pull tab extending from the largest “umbrella” fold. The tab is easily grasped to pull the In-Ear plugs out when the shooter is finished. This simple feature is another outstanding example of Safariland covering all of the aspects of a quality product. Ther have been plenty of times I’ve had to literally dig a set of foam ear plugs out of my ear, because they became so lodged in place during a long day of shooting. With no hole to release the counter-pressure of insertion, those plugs dug in and were difficult to remove. Shooting with the Safariland In-Ear Impulse plugs was outstanding. The great advantage of ear plugs in comparison to over the ear muffs is they are so compact and out of the way. This is particularly beneficial if the shooter is using a rifle or shotgun. Over the ear muffs often get in the way when shooting long guns, and can easily become dislodged during shooting causing painful and damaging effects to the shooter’s ears. Shooting both my AR-15 and my GA Precision Rock .308 sniper rifle had no problems with cheek weld and fit. Safariland’s In-Ear Impulseplugs fit securely in the ear, and their design significantly reduces the harsh impulse noise that can cause serious and sometimes permanent hearing loss. At the same time, the small cut in the metal plate behind the red Safariland center plug allows the shooter to hear nearby conversations. This is an advanced design over traditional “foamies” and allows shooters to clearly hear safety instructions, other officers directions, and more. 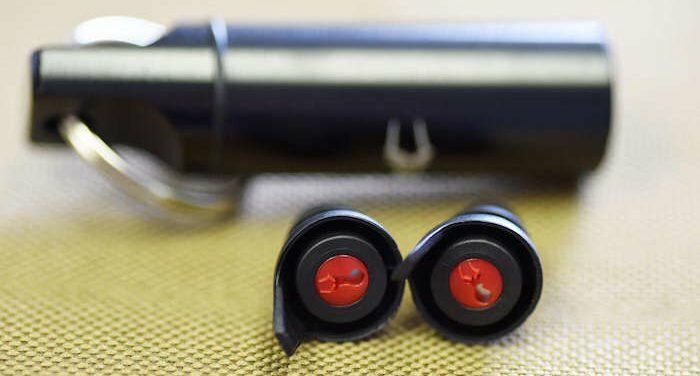 Once a round is fired off, or some other dangerously high impulse noise, the Safariland In-Ear plugs do their wonders and block the damaging noise from penetrating into the shooter’s ear. 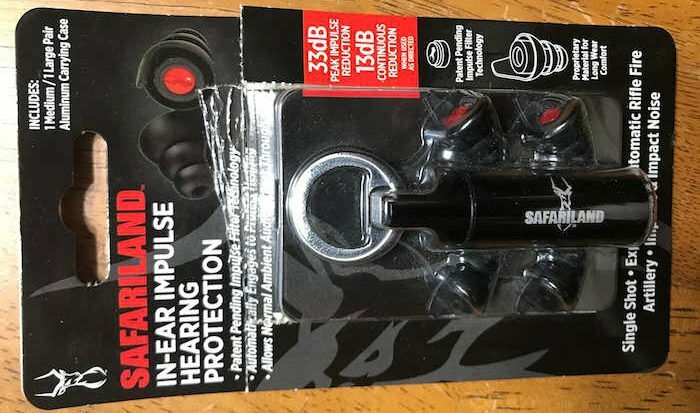 Safariland In-Ear Impulse plugs fit snuggly and securely in the shooter’s ear (note easy access pull tab). As the photograph above shows, the Safariland In-Ear plugs are concealed inside the shooter’s ear, and completely free from dislodgment concerns while shooting. The 33dB Noise Reduction Rating (NRR) impulse protection is among the very best ratings on the market for any type of hearing protection. In fact, many common foam ear plugs only offer a 29db NRR. Shooting on the outdoor range was fantastic. During non-shooting times I felt I could hear conversations well enough to understand and participate. When shooting was taking place the In-Ear plugs worked just as advertised. I could definitely notice a significant reduction in noise during shooting, and I did not experience any painful noise reaching my ears. On the indoor range I was just fine with the Safariland In-Ear Impulse plugs when shooting handguns. Even with multiple shooters I felt the noise was significantly reduced and shooting was pleasurable. It was great to not have to worry about electronics failing over-ear muffs, or having to take my muffs off to hear conversations. A close up of the Safariland In-Ear Impulse Hearing Protection plugs. However, when more than 2 shooters were firing our 10.5″ short-barrel (SBR) AR-15’s on the indoor range I began to notice the noise was getting closer to my uncomfortable level. This indoor range has (10) wide-open shooting lanes with the noise reduction paneled roof about nine feet above the concrete floor. Walls are covered with noise reduction material as well, but behind it all I was in a giant concrete box. I wouldn’t go as far as saying the noise of the SBR’s was painful with just the In-Ear plugs, because it wasn’t, but it was close enough I chose to double up with a set of over-ear muffs. If I had to guess, I believe the concussion from the SBR’s shorter barrel, the noise of the discharge, and the amplified reverberations bouncing off the concrete, caused the In-Ear plugs to vibrate just enough to allow more noise to pass through. 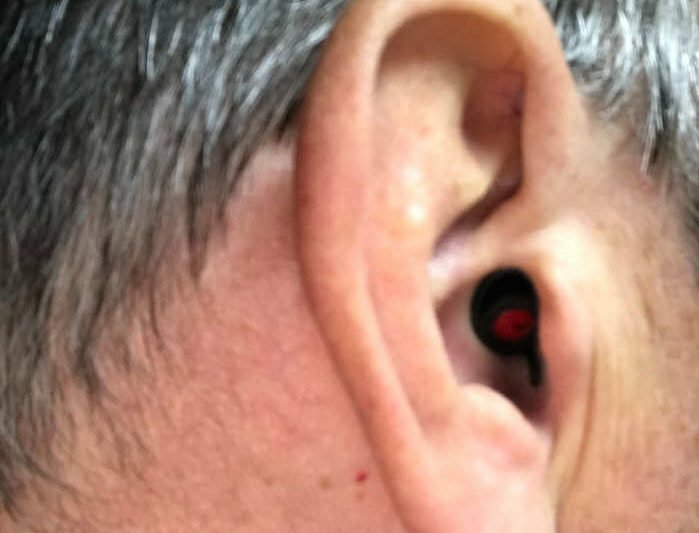 Again, it wasn’t painful, but having already been diagnosed with 15-20% hearing loss from two dozen years of heavy range work I wasn’t going to take the chance. In another comparison, I fired my .308 sniper rifle on an open range with just the Safariland In-Ear Impulse plugs and was just fine. 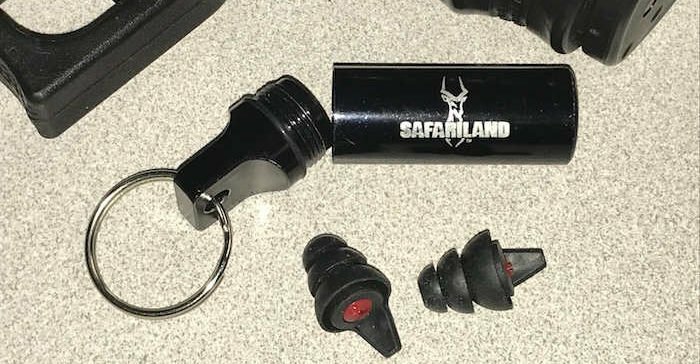 The Safariland In-Ear Impulse plugs come with aluminum key chain case, and a back-up pair of plugs. Overall I have been very impressed with the Safariland In-Ear Impulse Hearing Protection. The patent-pending impulse filter technology worked just great, and is something usually reserved for over ear muffs. The In-Ear plugs fit snuggly in my ear, but were perfectly comfortable for long periods of time. Impulse noise was drastically reduced, while enough ambient conversational noise came through allowing me to easily follow range master instructions, and talk to other officers during drills and while reloading. The In-Ear plugs pull tab is a great design feature and worked well to assist in removing the plugs. I would recommend placing the tabs on the bottom of the ear opening, as that seemed to be the easiest method for grasping. The convenient aluminum key chain carrier has become a standard carry for me, on my back-up duty car key chain. BlueSheepdog has no problem recommending the Safariland In-Ear Impulse Hearing Protection plugs for law enforcement and other types of shooting situations.